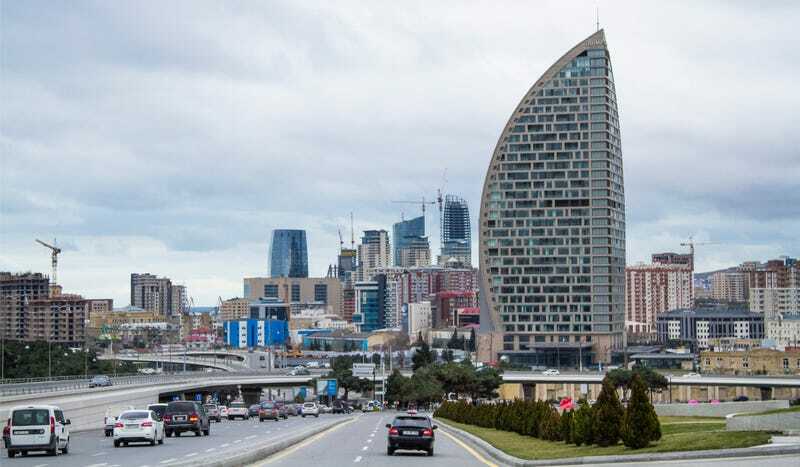 Representatives from Sport for Rights held closed-door meetings with the FIA this week over Azerbaijan’s numerous human rights issues ahead of its new Formula One European Grand Prix, reports Motor Sport. Additionally, the group is encouraging celebrity guests to withdraw from the race. With the European Grand Prix in Azerbaijan capital city Baku later this month, all eyes are on F1’s latest questionable dictator-state partnership. Sport for Rights is a coalition of organizations who want to shine a light on Azerbaijan’s appalling human rights record. Sport for Rights urged the Formula One Group to pressure Azerbaijan to release its political prisoners in May, per Human Rights Watch. Shortly afterwards, journalist Khadija Ismayilova was released from prison, but others still remain. Now Sport for Rights is speaking with the body over F1 in hopes of getting somewhere. While those at Monday’s meeting between Sport for Rights and the the FIA described it as “constructive” to Motor Sport, Sport for Rights coordinator and former U.S. diplomat Rebecca Vincent told reporters on Tuesday that holding a race in Azerbaijan is an affront to human rights. Johnson claims that the FIA’s willingness to work with a country that routinely imprisons journalists and oppresses political dissenters gives legitimacy to the Aliyev-led regime. Thus, in addition to putting pressure on the FIA, the group has asked performers booked for the weekend, such as Pharrell Williams, to cancel. Sponsors are running out of patience with bodies, including F1, which are associated with poisoned regimes. Some are tied in to long term deals, but we are seeing them becoming more activist. As with all things, I’ll believe it when I see it, but it’s about time that F1's financial backers took a stand. Azerbaijan is a repeat offender when it comes to glossing over their lack of freedom through hosting big, international sporting events—and don’t you dare bring that up if you want to enter the country and cover the event in person. Baku’s grand prix is a garbage booking made out of spite towards the ever-popular 24 Hours of Le Mans that only serves to legitimize a corrupt, oppressive regime. There is no good reason for anyone to support this race. Besides, did F1 learn absolutely nothing from Bahrain?